A Galaxy Note 2 mobile phone was used to capture this image of the Harvest Moon, rising over Kenexstone Camping and Touring Park on the Gower. 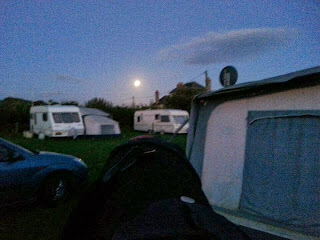 This is a superb location for astro-camping. A Harvest Moon, is the September full Moon that is closest to the equinox. This was first light for the camera and I am pleased with the result. On April 14, 2012 I posted here on the SAS blog, an afocal image of Saturn captured by SAS member Ken Shepherd. Ken had used an Olympus Camedia C-480 Zoom compact camera on a homemade afocal mount with a 90mm refractor. He had captured 9 images, which due to the nature of the equipment and the technique, the subject, Saturn was not in the same place on each image. In order to produce a stacked image with 3x the signal to noise ratio of an individual image, we used the prototype software written by Nicola Mackin, 'Precise Cropping Tool', (the forerunner to AstroCrop which has been in development since). We cropped an equal area with Saturn close to the centre from each of the images and stacked them in Registax to produce an image. The precise cropping was required because Registax requires images of equal size to be stacked. The movement of Saturn was such that Registax was unable to keep track of the 'movement' of Saturn from one image to the next. It can be seen that there was considerable movement of Saturn between the images. It can be seen that there is a ghostly image of Saturn above the rest of the stack showed the imperfect alignment. Using a larger alignment area, Registax 5 was only able to use two of the images. It can be seen that all of the images have been stacked correctly. The image is ready for further post processing. It is to be stressed that AstroCrop is not a substitute for Registax or Autostakkert. It has different functionality and is intended for different purposes. AstroCrop can be used with images of any size, but is intended to be able to deal with very large images. Registax often finds it hard to align a number of very large images, such as those obtained from a DSLR or a bridge camera, where there is significant displacement between the images. AstroCrop works in a completely different way and within very large limits, it doesn't matter how much the object of interest is displaced between images. AstroCrop can be used to crop precisely any image, to precisely defined dimensions, or can crop a batch of similar images to the same dimensions and register the images during the process. The final stack is a bonus that allows one to move on to post process the resulting image in other software. AstroCrop is a sophisticated, precise cropping tool. The release version will be freeware and will be able to work with JPG image files. The full version will be available for a small charge and will be able to deal with JPG, BMP, TIFF (8 and 16 bit) files. The program will be able to read and write all of these formats and will be able to save out combinations of formats simultaneously, or a single format selected by the user. The software is in advanced beta testing and the freeware release will occur in the near future. The software is developed by SAS member Nicola Mackin, an independent IT consultant and software developer; at Alternative Systems. Tonight I have been working with a beta version of Swansea Astronomical Society member, Nicola Mackin's latest software: "AstroCrop". This software allows the user to crop an image to specific dimensions rather than using an arbitrary cropping tool such as is found in all image processing programs. So, if I wish, for example, to crop out an area of exactly 1500 x 1500 pixels from a large image, I can do this precisely. If I have a number of images of the same object and I wish to crop them all, the software will crop them either semi-automatically, or fully automatically to exactly the dimensions required. Moreover, the cropped images will have been registered. The end of the automatic cropping process for a set of images is a set of registered images of exactly the same, prescribed dimensions, and a stacked image ready for further processing. I shall be writing and talking about this software in the near future when it is in its release version. It is fundamentally different from software such as Registax and Autostakkert and is not intended to be a competitor. It is a precise cropping tool that will give cropped images of exact, precise dimensions, something that is not easy to achieve in most image processing software. If a set of replicate images are cropped and registered, then the stacked image produced at the end will have a higher signal to noise ratio than an individual image in proportion to the square root of the number of images stacked. This image is ready for further processing. Nicola will soon be releasing this software as a freeware program that for a small price can be upgraded to a program with more functionality. 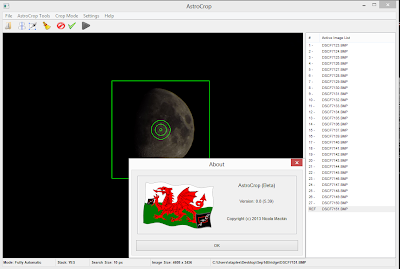 It is good to see yet more astronomical software coming out of Wales.